From the Big Island to Kauai, the far side of Maui to the bustling streets of Honolulu, experience paradise in all its glory…and darkness. This collection of ten stories brings out the beauty of the islands, the passion of the tropics, and, yes, murder. Join ten writers who love the islands and want you to savor the tropics while benefiting literacy in Hawaii. We hope you’ll join these ten writers who love the islands and want you to savor the tropics while benefiting literacy in Hawai‘i. 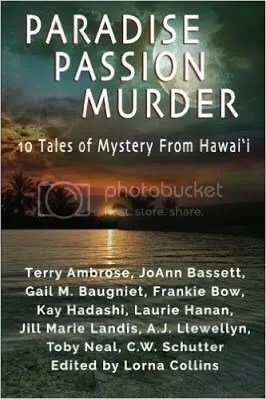 Join Terry Ambrose, JoAnn Bassett, Gail Baugniet, Frankie Bow, Lorna Collins (editor), Kay Hadashi, Laurie Hanan, Jill Marie Landis, AJ Llewellyn, Toby Neal, and CW Schutter for Paradise, Passion, Murder. This collection includes short stories from some of bestselling Hawai‘i mastery series, including JoAnn Bassett’s Islands of Aloha mysteries, Jill Marie Landis’s Tiki Goddess series, and Toby Neal’s Lei Crime series. The stories travel the islands from Kaua‘i to O‘ahu and range from laugh-out-loud funny to heart wrenching. Join us today and help benefit literacy in Hawai‘i.